Day 3 - Arrive at Auckland on the North Island. Transfer by private car to Hotel Du Vin, located in the "De Redcliffe Winery". This hotel has won awards for cuisine, architecture, and service. Guided wine tours, tennis, and massages are available. Many of New Zealand's noted golf courses are close by. Day 4 - Suggestion ~ Golf at the "Gulf Harbour Country Club", Hibiscus Coast, Auckland designed by Robert Trent Jones. Day 5 - Private car transfer to Auckland Airport for your short flight to Taupo. 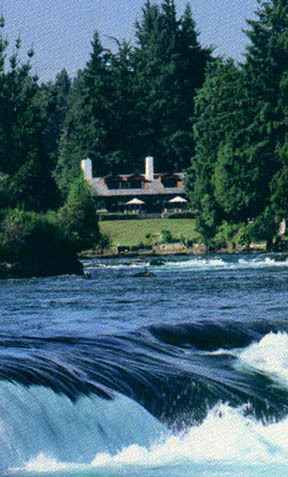 Upon arrival you will be met and transferred to New Zealand's Relais Chateaux Huka Lodge. Taupo is famous for trout fishing, golf, and white water rafting. Day 6 - Suggestion ~ Golf at Wairakei International Golf Course, Taupo. Day 7 - Transfer to Rotorua Airport for your short flight to Wellington, the capital city of New Zealand. Transfer by helicopter to Wharekauhau Country Estate, which is set on 5,000 acres of private land including rivers, lakes and forests. The lodge offers professionally guided activities, including horseback riding, diving, and fishing. The lodge, noted for its cuisine and is situated in one of New Zealand's outstanding wine regions. Day 8 - Day at leisure. Day 9 - Transfer to Wellington for your short flight to Queenstown on the South Island. Upon arrival you will be met and transferred to Millbrook Resort, Queenstown. The Millbrook course was designed by New Zealand golf professional Bob Charles and has played host to Heads of Government conferences. This is perhaps New Zealand's most famous course, it is in a spectacular setting. Day 10 - Suggestion ~ Golf at Millbrook and enjoy the many attractions that Queenstown has to offer. Day 11 - Optional fly in / out tour to Milford Sound, including lunch and cruise. Day 12 - Transfer to Queenstown for your flight back to the U.S.A.